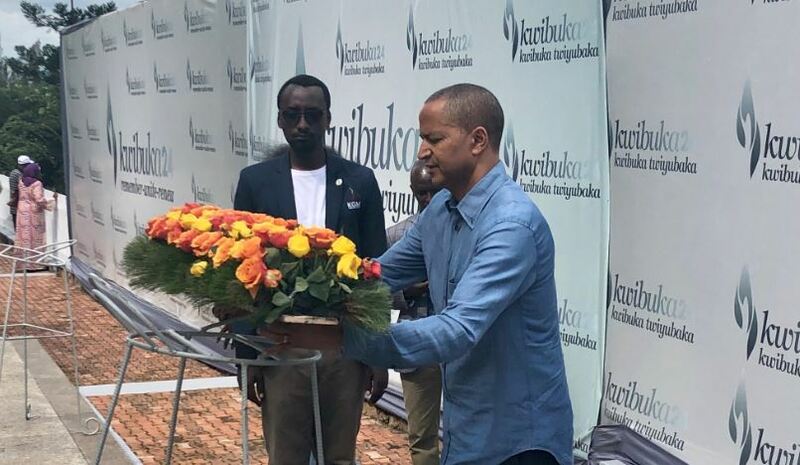 DR Congo opposition politician and self declared contender in the forthcoming Presidential elections, Moïse Katumbi, has laid a wreath on the burial site of victims of the 1994 genocide against Tutsi. The politician was driven to the Kigali Genocide Memorial site where over 250000 victims lay to rest. Katumbi later described his experience at the memorial site. “Strong and moving visit to the Kigali Genocide Memorial . It is up to us to fight for such a tragedy to never happen again. Neither in Ituri, nor in Beni, where every day innocent people are slaughtered, nor anywhere else in the world…we are all brothers and sisters, and every life is sacred,” he said. Katumbi has been in the country for almost a week where he attended the Mo Ibrahim Governance Weekend – a flagship event of the Mo Ibrahim Foundation. Katumbi a sharp critic of DR Congo leader Joseph Kabila and is wanted back home for an ogoing trial for a case in which the former Katanga governor is charged with running a covert mercenary group. Meanwhile, in line with the 24th commemoration of the 1994 Genocide against Tutsi, Kigali Genocide Memorial is hosting a drama at the Amphitheater. The drama is a second edition of Quest2TheCure by Shekinah Drama Team. The drama tells a story of the post-genocide generation’s journey to understand the harrowing past of the genocide against the Tutsi and to find their own path towards a future free from genocide.